Do you have some crazy aunts in your family? I think everybody does. I certainly did – two of them – my father’s sisters. They were truly characters. They also were the gatekeepers to the family secrets – secrets I desperately needed to know! William George Estes and Ollie Bolton Estes family. 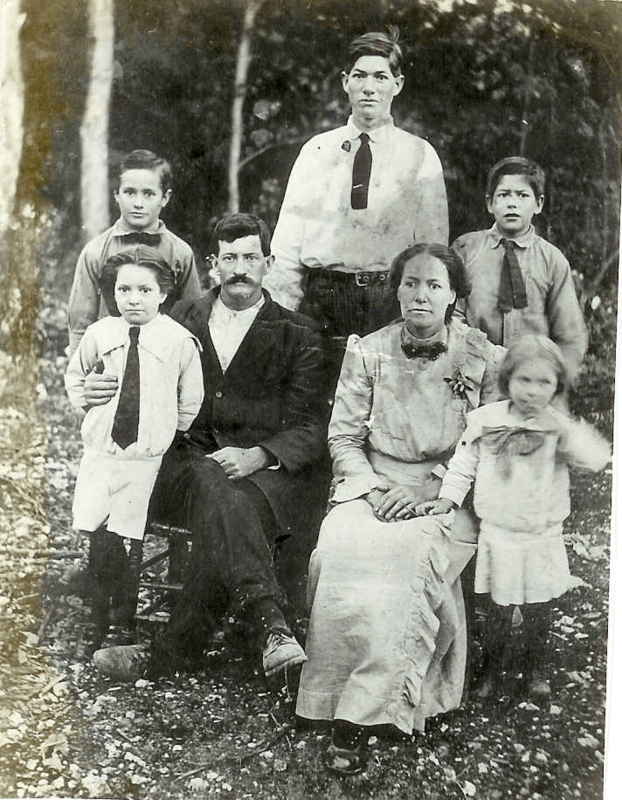 Children are left to right, daughter Margaret, behind Margaret, Joseph “Dode,” tall male is Charles Estle, male at right rear, my father, William Sterling Estes, looking worried, and blonde female at right beside Ollie is Minnie. 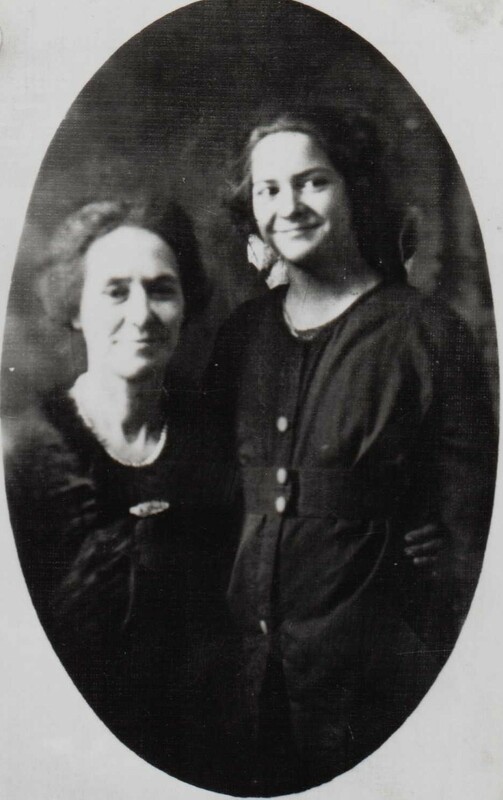 The aunts names were, officially, Margaret Lee Estes (born 1906, the brunette at left, above) and Minnie Mae Estes (born 1908, the blonde at right). I say officially, because they were fond of changing their names from time to time. That made it really difficult when discussing family items because their names were always different. Margaret seemed to settle on Jean and Minnie settled somewhat on Betty. No, I don’t know why. What I do know is that they were indeed, drama queens and they seemed to have a bit of sibling rivalry from the beginning that lasted, well, to the very end – and they both lived to be just shy of 100. They started out as drama princesses when they were young. Both were exceptionally beautiful young women. Margaret, below, is reported to have done some modeling in Chicago about 1925, and of course she sent her modeling photos to her sister Minnie. Both women would marry, both had one son. Both sons died tragically. Instead of bringing the sisters together, it seemed to further widened the gap. Some of their crazy stories revolve around the sons and their deaths. There are allegations of murder, the mob, the mafia, huge stolen insurance policies and such. From the other sister, the same death story is quite different – homelessness, alcoholism, you get the idea. What is consistent is a lot of pain surrounding the deaths and jealousy between the sisters. And what’s worse, or better, is that I discovered that every time either of them discussed the stories, or each other, or anything for that matter, that the stories evolved or changed. They were never the same. Peachy, just peachy! I didn’t find the sisters until they were in their late 70s. My parents were divorced and my father was killed in an automobile accident when I was in grade school. We lived about 400 miles from my father’s Tennessee family, and for some reason, my mother really didn’t want me hanging out with my Dad’s moonshining family. I would probably have loved them, which is exactly what she was worried about. It wasn’t until many years later, when I was in my 20s, that I began searching for my father’s family to find out something, anything. That’s when I was directed to the aunts. They were the only siblings of my father yet living, and I was thrilled to find them. I initially wrote down every word they said…until I discovered that my notes from conversation to conversation contradicted each other. And if you asked them about what they said before, they would accuse you of lying, or worse, yet, talking to the enemy – the other sister – who had of course, lied. For awhile, I truly wondered if somehow I confused my notes and questioned my own sanity. I’m extremely glad I took those notes. I put them away and years later, transcribed them. Margaret told about her homes around the world, and in the next conversation, would discuss her poverty. One time she told me that her family was spying on her to take her money. Minnie told about one of her husbands who was a politician and their time “on the hill” which I’m presuming was supposed to be Capitol Hill. I finally came to view the stories as just amusing and left it at that. They also did interesting things from time to time. Minnie/Betty once sent a pair of red sequined ballet slippers to the daughter of her deceased brother with a note that said that “no one in Tennessee loves me.” Whose slippers they were, we have no idea – she didn’t dance. Everyone in Tennessee was left someplace between amused and mystified with maybe a little creeped-out added along the edges. There were nuggets of truth in those stories however, although they were disjoint and mining them has proven to be challenging. However, these past few days, the crazy aunts’ stories came through . Margaret was only married once, but Minnie/Betty was married several times. I couldn’t keep her husbands straight and I don’t think she could either. However, both aunts loved to discuss my father, because whatever they had done, his escapades made theirs pale by comparison. The only bad thing was that the aunts seemed to have snippets of this and that. The all lived in different states and I think most of what they heard was through their mother, Ollie. They loved to talk about people, and my father with his gallivanting ways proved quite a popular topic of conversation and fodder for a lot of tongue wagging and clicking. Tisk, tisk, tisk….naughty boy. Yes, indeed. But thankfully their love of gossip and “telling on him” and their rivalry to see who could tell the ‘worst” story has provided me with a couple very valuable nuggets. As it turns out, they were partially right, except they had Lee’s mother’s name wrong, unless, God forbid, there are two Lees, a possibility I’m going to entirely discount right now, to protect any shred of sanity I have left. In my 52 Ancestors week #1 article, “ Searching for Ilo’s Son,” as things have developed, we discover that Ilo’s son’s name was Leo and his step-father’s name was Levine and in the 1930s, Ilo was living in Louisville, Ky. I remember writing years ago to a seminary in Louisville asking about a student from that time frame named Lee Levy, Levi or Estes. Of course, they didn’t find anything, but now I need to revisit this. I will catch everyone up on that story, probably next week. However, if you happen to know of a minister born about 1920 named Lee or Leo Thomas Devine, by all means, let me know. And score one for the crazy aunts! Also, were it not for both of those women, I would have no photos of the family – none. Margaret had hers copied and sent them to me in the 1980s, with much ado and guilt inducing rhetoric. Remember, they were drama queens, and very experienced ones too. “No, you can’t pay me for them…I’ll gladly do without food.” Ok, so maybe not quite that dramatic, but you get the drift. Minnie shared her photos with her grandson’s x-wife, who graciously shared them with me. In fact, it was the grandson’s x-wife and her boys who helped Minnie/Betty through her elder years. It’s a good thing we got copies of these photos when we did, because when the aunts died, there were absolutely no personal effects to be found anyplace. Minnie’s grandson’s x-wife and sons did one more thing too….they got a DNA sample from Minnie during one of their visits, years ago. Our maternal (mitochondrial) family tree is shown below. 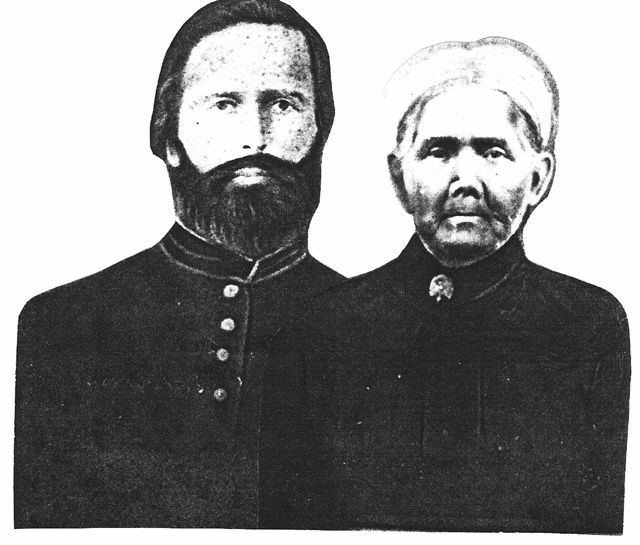 This photo is of Elizabeth Speaks and Samuel Claxton in his Civil War uniform. 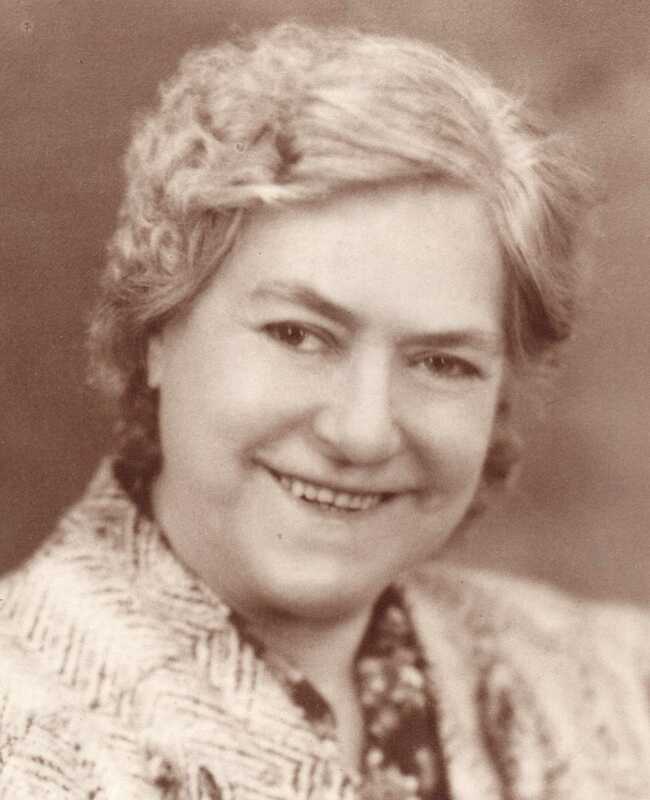 I’d love to have a photo of Margaret Claxton/Clarkson and Joseph Bolton, but none have surfaced to date. I’ve always wondered, though, if this photo taken about 1918, below, is of Margaret Estes (my aunt) and her grandmother, Margaret Claxton, and not her mother, Ollie. The problem is with the labeling. 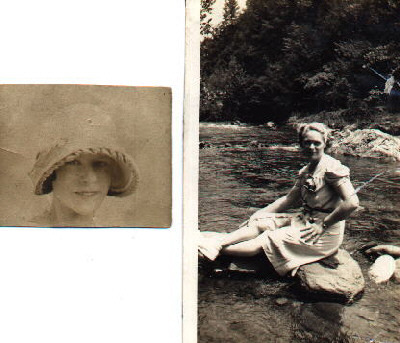 Another family member has this photo labeled “Margaret and grandma” which, depending on who wrote it, could be Ollie Bolton Estes or Margaret’s grandmother (Ollie’s mother,) Margaret Claxton. Ollie would have been about 45-50 in the photo and her mother would have been about 65-70. It was taken in Chicago, and I do have to wonder if Margaret Claxton would have visited Chicago, but you never know! Here is Ollie Bolton Estes and William George Estes about 1914. We think this colorized photo is of Ollie, but we’re not sure. No label. It was in Minnie’s photos, but it wasn’t in Margaret’s, so we don’t really know. Here’s Ollie as an older woman. We may not know Elizabeth MeKee’s maiden name, but we know that she and all of these women, her descendants, are haplogroup H, European. No hidden Indian princesses here. The problem is that when I tried to upgrade Minnie’s DNA sample to the full sequence to find out more, it failed. Not enough DNA or too old. I’d love to find someone else to test for this maternal line. There’s a scholarship for anyone descended from any of these women in the maternal family tree through all females to the current generation. In the current generation, the tester can be a male or female. Women give their mitochondrial DNA to both genders of their children, but only females can pass it on. For more info on how genealogy DNA testing works, click here. If you descend from this line in any fashion, I’d love to hear from you. You can leave a comment or e-mail me at robertajestes@att.net. And as for those crazy aunts, I hope they found some common ground in the afterlife that they were unable to find here. And maybe, just maybe, the family members “over there” are helping in some way to unravel this Ilo Bailey, William Estes, Leo Devine mystery. Heaven knows, I can certainly use all the help I can get! Really nice. Sounds similar to my line that is connected to that part of the country. Grandma Wolf (Ross) started telling me stories when I was young. She told people that after her father left and remarried (3 times that I have been able to find), that she was taken in by interesting ladies. I have never been able to verify this. But it was the roaring twenties and Fort Wayne was not that far from Chicago. 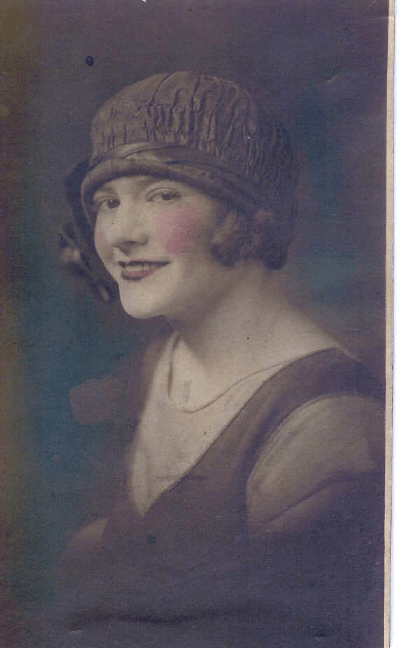 Her husband’s uncle John Gosche was supposed to work for Al Capone. I still think this is why we moved to California when I was 11. Mom went to Catholic School and really did not care for all of these tales. I did have a great uncle by the name of John Gosche who lived in Chicago. We visited Aunt Susan when I was a kid. So far no verification of the mob etc. The Moonshine was my Greene County, Tennessee in-laws. That is another story. 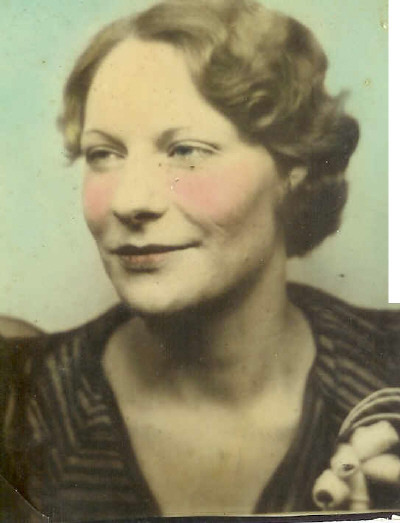 Wonderful story, Roberta – with great details of a very challenging pair of aunts as well. Who’s Who, indeed! Thanks for sharing your details. Hopefully you’ll find someone who knows all about Leo – or maybe a new story altogether. Cheers. These stories were incredible and literally made me chuckle out loud-“No, you can’t pay me, I don’t need to eat!” Priceless. Thanks for sharing!! when I study the eyes of Margaret and Ollie, I do not think the color photo is Ollie because of the stigma in Ollie’s left eye. Margaret seems to be looking straight in all photos of her. Good luck with identifying these two correctly. I agree with you for that exact reason. I loved the story and am sure I would have loved both aunts. My family was/is full of such characters. We used to just almost roll in the floor laughing when we all got together. Brilliant stuff and I can a see you in them. Thank you. That is my grandfather. From Ohio Birth Index – William Douglas Devine was born 31 Dec 1929 s/o Leo & Ilo , Birth date in SSDI matches this date. There is also a Matthew Thomas Devine & Robert James Devine born to Leo & Ilo in Ohio. DEVINE, WILLIAM DOUGLAS, 77, of Louisville, passed away on Tuesday, March 27, 2007, at Jewish Hospital. Mr. Devine was a retired captain on the Louisville Fire Department, a member of the Fire Fighter’s Union, Retired Fire Fighters, honorary member of the 10th. Mountain Division, and Guardian Angels Catholic Church. He is survived by his wife of 56 years, Mary Lee Devine; a daughter, Dusty Callahan-Hardin (Tim); and two grandchildren, Ryan and Caitlin Callahan. Funeral Mass will be 10 a.m. Saturday at Guardian Angels Catholic Church, 6000 Preston Highway. Burial will follow in Resthaven Memorial Park. Visitation will be 2-8 p.m. Friday and after 8:30 a.m. Saturday at Arch L. Heady at Resthaven, 4400 Bardstown Rd. Expressions to Guardian Angels Catholic Church. Published in The Courier-Journal on 3/29/2007. I tried last night to find an obit in Louisville for Lee J or Leo J. Devine who as born Feb. 24, 1920 and who died on Jan 1, 1989 in St. Petersburg, Fla. He has a death record apparent in both Louisville and Florida. He was brought home and buried in the Howe Valley Cemetery in Hardin Co, KY. I found him on find-a-grave. He doesn’t quite match the name for Leo earlier, but it’s close and seems to match other info to be the brother of Matthew. I’m just frantic to find that obit. Do you have access to it? Sorry, I don’t. You can search back to 2002 on their web site. I saw the same Lee Joseph Devine. I suspect that is him. I think William Douglas Devine married Mary Branch – child, Angela M Devine. I found a Angela M Devine having a Ryan & Caitlin in the KBI. Hi Roberta! What a HOOT! I am still giggling! I am most positive that the above color photo IS Minnie/Betty. I have another photo of her, b/w, but it sure does look like her. 1. John Raymond Price m. Jan 1926 Lee Co., VA divorced. 2. Maurice Allen Deberry m. ca. 1940 Dixie Co., FL until his death. 3. Paul Carl Frederick m. Jan 1968 Dixie Co., FL until his death. I don’t know if he’ll do it, but I can have the boys ask John Jr. if he will do the DNA. I don’t know if it will show anything. I am going to print this & get it to the boys, They are going to love it! Their Dad’s mom, Jeanette loved to tell tails & keep secrets too, lol. Minnie told me she was also married to a W. R. Marcum in Claiborne Co. TN about 1940. Do you know anything about that? Yes, I was going to add it in, but I couldn’t find where I had stuck the files and didn’t want to put in the wrong info. She married on 28 Apr 1940 Claiborne Co., TN; Walter R. Markum/Marcum b. 22 Sept 1911 Rose Hill, Lee, VA d. 3 Jul 1953, also Rose Hill. He seems to have been a neighbor to the Dr. David Peirce that Minnie worked for as a servant in 1930 and in 1940, was a salesgirl at the Pharmacy, but still lived with David & Kitty, after her marriage to W. R, he was still living with his family, she is listed as Minnie Marcum and John D. is listed as 12. Walter joined the Army, 21 Mar 1942 in Rose Hill, John Raymond joined on 27 Apr 1942 in Leesburgh, Loudon, VA. What I haven’t found is a divorce from him, nor marriages to Maurice Deberry nor Paul Frederick! I guess I will have to drive over to Steinhatcher for that! [Steinhatchee]. I haven’t found the ‘actual’ marriage nor divorce to/from John Price, either! I do know that she & Maurice ran a tourist ‘Fish Camp’ in Steinhatchee, called “DeBerry’s Lodge & Kitchenetts”. It does seem that everyone from Rose Hill, Lee, VA rushed off down to Claiborne Co., TN to do their marrying! I’ll let you know if I find anything new. I still have my Estes tree as well as the Price tree up on Ancestry. Thanks for sharing the photos and stories, Roberta. Sounds like a convoluted story a friend told me. She was sure her Alabama ancestors fought in the Civil War but no matter how much she searched their names did not turn up. That was until she wondered, “Could they have fought for the ‘other side’?” Sure enough, there were in the U.S. Army during the war of “Northern Aggression” (as some die-hard southerners like to call it). Turns out there was an entire Alabama county that was for the “other side” during the Civil War. They didn’t appreciate the state seceding from the union so they seceded from the state and joined the union army! It goes to show you can’t always be sure about history or genealogy. That sound like “The State of Jones” in Mississippi. My. The black and white picture of Ollie looks just like….me. i’m an Estes descendant, but I am curious about where in TN your Estes family was. There were also Esteses in Warren Co TN who may have intermarried with other families from whom I am descended (Mullican and Cantrell.) Weird. My family is from Claiborne County. Actually, I just noticed that the one labeled “Ollie” that looks like me looks nothing like the others labeled Ollie. The cheekbones are way different, and the hairline and eyebrows. The one of William George looks like my brother a couple of decades ago. Sylvester Eastes and Ellen Martin > Abraham Estes and Barbara Brock > Elisha Estes b 1703, King and Queen Co, VA > Elisha Estes b 1729 who m Frances Bottom > Elisha Estes b 1754 who m Mary Herd > Fanny or Frances Estes, b 1777 Franklin Co, VA, who m Joshua Warren Brock > Joshua Warren Brock b 1807 who m Susanna Damron Sally Eliza Brock who m Creech Ancil Carter > Winnie Dee Carter > Mother (living) > myself. Enjoyed your blog post–and I just had a similar thing happen to me. 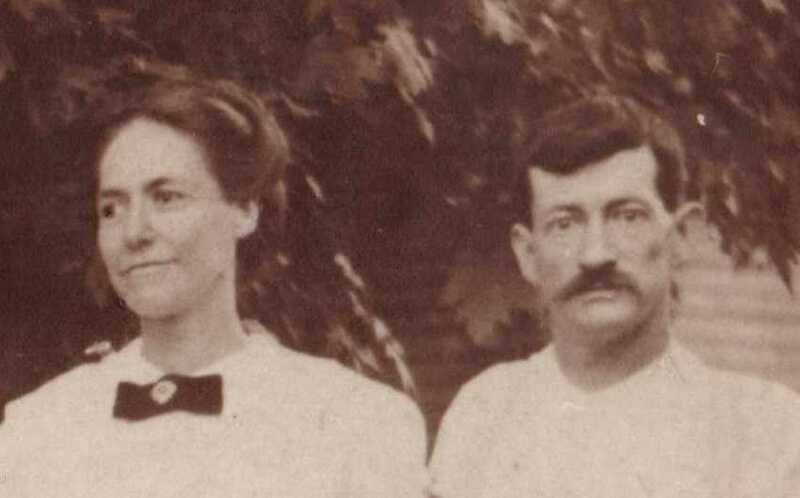 Two living ancestors remember details differently about my great-grandfather. One remembers him taking a shot of VO and a raw egg every morning before walking 4.5 miles to work. The other remembers his father telling him that his grandfather drank a glass of wine before work every morning. Could it have been both! Anyway, I am struck by your blog post because it is just so human…that peculiar mix of sadness and humor and bitter feelings. Roberta, I am so enthralled by your story and journey! I’m just getting started. It reads like a mystery novel. Also, because of the areas you are mentioning in Kentucky, Michigan, Indiana, and Chicago, I expect to see some my family surnames included. Thank you for this blog, I’m so glad I stumbled upon it.